This week we have family visiting from the States, and the cousins are celebrating a lot of special occasions together. The two oldest boys have birthdays at the end of May, so I thought I’d create this card for my 15 year old nephew. It showcases The Cat’s Pajamas fun combination of Boom! CutUps, Comic Balloon CutUps and TCP’s stamp set My Hero. 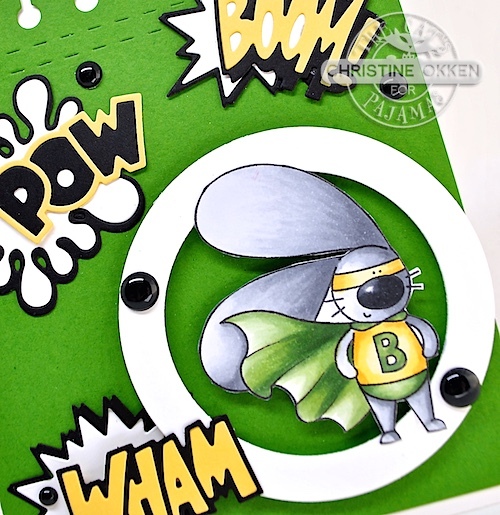 My nephew loves green so this is a bit of a “Green Lantern” superhero card. Our bunny is coloured with Copics, trimmed out and placed on TCP’s Framed Up 2 CutUps. I added a notebook edge with TCP’s Toppers CutUps. A few black enamel dots finish it off. 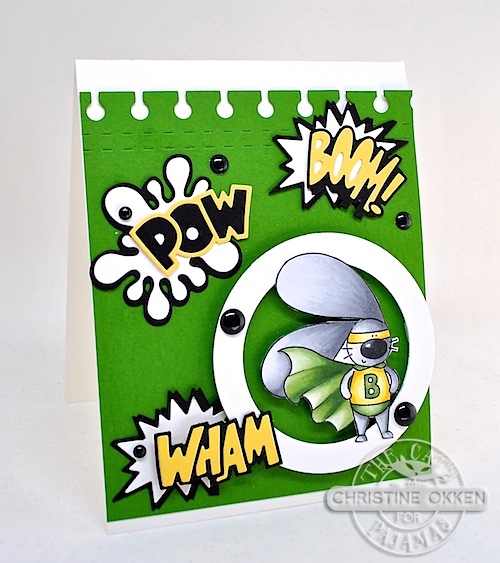 You don’t need a lot of embellishing with the pop of the comic book style colours and words. The inside of the card reads “Dare to Be Who You Are” from the stamp set. A good encouragment for a 15 year old. Here’s the Copics I used above. Did you new Sneaky Peek Week starts today?? 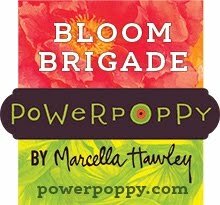 All the TCP items are being previewed each day on the TCP Blog. I’ll be up with all my new goodies next week! Thanks for stopping by! so fun, just like out of a comic page, he is going to love it, have fun with your family! !